For other uses, see Mr. T (disambiguation). Laurence Tureaud (born May 21, 1952), known professionally as Mr. T, is an American actor, bodyguard, television personality, and retired professional wrestler, known for his roles as B. A. Baracus in the 1980s television series The A-Team and as boxer Clubber Lang in the 1982 film Rocky III. Mr. T is known for his distinctive hairstyle inspired by warriors of Mandinka nation in West Africa, his gold jewelry, and his tough-guy image. In 2006, he starred in I Pity the Fool, a reality show shown on TV Land; the title of the show comes from the famous catchphrase used by his character, Clubber Lang. I think about my father being called 'boy', my uncle being called 'boy', my brother, coming back from Vietnam and being called 'boy'. So I questioned myself: "What does a black man have to do before he's given the respect as a man?" So when I was 18 years old, when I was old enough to fight and die for my country, old enough to drink, old enough to vote, I said I was old enough to be called a man. I self-ordained myself Mr. T so the first word out of everybody's mouth is "Mr." That's a sign of respect that my father didn't get, that my brother didn't get, that my mother didn't get. Tureaud attended Dunbar Vocational High School, where he played football, wrestled, and studied martial arts. While at Dunbar he became the citywide wrestling champion two years in a row. He won a football scholarship to Prairie View A&M University, where he majored in mathematics, but was expelled after his first year. He then enlisted in the United States Army and served in the Military Police Corps. In November 1975, Tureaud was awarded a letter of recommendation by his drill sergeant, and in a cycle of six thousand troops Tureaud was elected "Top Trainee of the Cycle" and was also promoted to squad leader. In July 1976, Tureaud's platoon sergeant punished him by giving him the detail of chopping down trees during training camp at Fort McCoy in Wisconsin, but did not tell him how many trees, so Tureaud single-handedly chopped down over 70 trees from 6:30–10:00 a.m., when a shocked major superseded the sergeant's orders. After his discharge, he tried out for the Green Bay Packers of the National Football League, but failed to make the team due to a knee injury. Tureaud next worked as a bouncer. It was at this time that he created the persona of Mr. T. His wearing of gold neck chains and other jewelry was the result of customers losing the items or leaving them behind at the night club after a fight. A banned customer, or one reluctant to risk a confrontation by going back inside, could return to claim his property from Mr. T wearing it conspicuously right out front. Along with controlling the violence as a doorman, Tureaud was mainly hired to keep out drug dealers and users. During his bouncing days, Tureaud was in over 200 fights and was sued a number of times, but won each case. "I have been in and out of the courts as a result of my beating up somebody. I have been sued by customers whom I threw out that claimed that I viciously attacked them without just cause and/or I caused them great bodily harm as a result of a beating I supposedly gave them," Mr. T once remarked. He eventually parlayed his job as a bouncer into a career as a bodyguard that lasted almost ten years. During these years he protected, among others, sixteen prostitutes, nine welfare recipients, five preachers, eight bankers, ten school teachers, and four store owners. As his reputation improved, however, he was contracted to guard, among others, seven clothes designers, five models, seven judges, three politicians, six athletes and forty-two millionaires. He protected well-known personalities such as Muhammad Ali, Steve McQueen, Michael Jackson, Leon Spinks, Joe Frazier and Diana Ross, charging $3,000 per day, to a maximum of $10,000 per day, depending on the clientele's risk-rate and traveling locations. With his reputation as "Mr. T", Tureaud attracted strange offers and was frequently approached with odd commissions, which included assassination, tracking runaway teenagers, locating missing persons, and large firms asking him to collect past-due payments by force. Tureaud was once anonymously offered $75,000 to assassinate a target and received in the mail a file of the hit and an advance of $5,000, but he refused it. He offered me $75,000 to kill his friend. The last envelope and letter contained a round-trip airline ticket, first class, United. Plus there was $5,000 wrapped in a little package, fifty and hundred dollar bills. I tell you the honest truth, when I saw that money I didn't believe it was real. Tureaud states that he tried to warn the victim, but it was too late and the man died in a car accident. In accepting a client, Tureaud had two rules: the client must not lie to him and must shop around first. He also made it clear to the client beforehand that he could not promise them their lives, "I did everything except guarantee people's lives, but I guarantee you that I will give my life protecting yours". He carried a .357 Magnum and a .38 caliber snubnose revolver. He weighed an average of 255 pounds (116 kg). While he was in his late twenties, Tureaud won two tough-man competitions consecutively. The first aired as "Sunday Games" on NBC-TV under the contest of "America's Toughest Bouncer" which included throwing a 150-pound (68 kg) stuntman, and breaking through a 4-inch (10 cm) wooden door. For the first event, Tureaud came in third place. For the end, two finalists squared off in a boxing ring for a two-minute round to declare the champion. Making it to the ring as a finalist, he had as his opponent a 280-pound (130 kg) Honolulu bouncer named Tutefano Tufi. Within twenty seconds "Mr. T" gave the six foot five competitor a bloody nose, and later a bloody mouth. He won the match and thus the competition. The second competition was aired under the new name "Games People Play" on NBC-TV. When interviewed by Bryant Gumbel before the final boxing match, Mr T. said, "I just feel sorry for the guy who I have to box. I just feel real sorry for him." This fight was scheduled to last three rounds, but Mr. T finished it in less than 54 seconds. The line, "I don't hate him but...I pity the fool" in the movie Rocky III was written by Sylvester Stallone, who is reputed to have been inspired by the interview. While reading National Geographic, Mr. T first noticed the unusual hairstyle for which he is now famous, on a Mandinka warrior. He decided that adoption of the style would be a powerful statement about his African origin. It was a simpler, safer, and more permanent visual signature than his gold chains, rings, and bracelets. The gold jewelry was worth about $300,000 at the time and took him about an hour to put on. Most nights, Mr. T spent even more time cleaning them using an ultrasonic cleaner. Occasionally, he slept with the heavy neck chains and bracelets on, "to see how my ancestors, who were slaves, felt." In 1980, Mr. T was spotted by Sylvester Stallone while taking part in NBC's "America's Toughest Bouncer" competition, a segment of NBC's Games People Play. Although his role in Rocky III was originally intended as just a few lines, Mr. T was eventually cast as Clubber Lang, the primary antagonist. His catchphrase "I pity the fool!" comes from the film; when asked if he hates Rocky, Lang replies, "No, I don't hate Balboa, but I pity the fool." 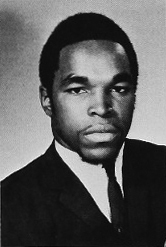 Subsequently, after losing out on the role of the title character's mentor in The Beastmaster, Mr. T appeared in another boxing film, Penitentiary 2, and on an episode of the Canadian sketch comedy series Bizarre, where he fights and eats Super Dave Osborne, before accepting a television series role on The A-Team. He also appeared in an episode of Silver Spoons, reprising his old role as bodyguard to the character Ricky Stratton (played by Ricky Schroder). In the episode, he explains his name as "First name: Mister; middle name: period; last name T." In one scene, when Ricky's class erupts into a paper-ball-throwing melee, Mr. T throws his body in front of the objects, fully protecting his client. In The A-Team, he played Sergeant Bosco "B. A." Baracus, an ex-Army commando on the run with three other members from the United States government "for a crime they didn't commit." As well as the team's tough guy, B. A. was a genius mechanic but afraid of flying. When asked at a press conference whether he was as stupid as B. A. Baracus, Mr. T observed quietly, "It takes a smart guy to play dumb." His role in The A-Team led to him making an appearance in the long-running sit-com Diff'rent Strokes in the sixth season opener "Mr T. and mr. t" (1983), in which an episode of The A-Team is supposedly filmed in the family's penthouse apartment. A Ruby-Spears-produced cartoon called Mister T premiered in 1983 on NBC. The Mister T cartoon starred Mr. T as himself, the owner of a gym where a group of gymnasts trained. He helped them with their training but they also helped him solve mysteries and fight crime in Scooby-Doo-style scenarios; thirty episodes were produced. The year 1983 also marked the release of the only film that can be called a Mr. T vehicle, DC Cab. The movie featured an ensemble cast, many of whom were publicized figures from other areas of show business – comics Paul Rodriguez, Marsha Warfield, singer Irene Cara, bodybuilders David and Peter Paul (the "Barbarian Brothers") – but who had only modest acting experience. Despite the wide range of performers, and more seasoned actors such as Adam Baldwin as the protagonist Albert, as well as Gary Busey and Max Gail, Mr. T was top billed and the central figure in the film's publicity, with him literally towering over the other characters on the film's poster. While the film, featuring the ensemble as a ragtag taxi company trying to hustle their way to solvency and respectability, performed modestly at the box office, its $16 million take exceeded its $12 million budget and it has since become a minor cult favorite for its kitchen sink geniality. It was the second feature in a prolific career for director Joel Schumacher. In 1984, he made a motivational video called Be Somebody... or Be Somebody's Fool!. He gives helpful advice to children throughout the video; for example, he teaches them how to understand and appreciate their origins, how to dress fashionably without buying designer labels, how to make tripping up look like breakdancing, how to control their anger, and how to deal with peer pressure. The video is roughly one hour long, but contains 30 minutes of singing, either by the group of children accompanying him, or by Mr. T himself. He sings "Treat Your Mother Right (Treat Her Right)," and also raps a song about growing up in the ghetto and praising God. The raps in this video were written by Ice-T.. On January 19, 1985, he introduced Rich Little at the nationally televised 50th Presidential Inaugural Gala, the day before the second inauguration of Ronald Reagan. In 1988, Mr. T starred in the television series T. and T. Mr. T was once reported to be earning around $80,000 a week for his role in The A-Team and earning $15,000 for personal appearances. By the end of the 1990s, he was appearing only in the occasional commercial, largely because of health problems (in 1995, he was diagnosed with T-cell lymphoma). He frequently appears on the TBN Christian television network. He has appeared on Late Night with Conan O'Brien. He has also appeared on some Comcast commercials, and in the United Kingdom, Ireland, Australia and New Zealand during 2007, advertising the chocolate bar Snickers with the slogan "Get Some Nuts!" One of these commercials, featuring Mr. T crashing through a wall on the back of a technical vehicle before firing Snickers bars at a speed walker wearing tight-fitting yellow shorts, was pulled by Mars following a complaint by the U.S.-based group Human Rights Campaign, despite the fact that the advert had never been shown outside the U.K. The group alleged that the commercial promoted the idea that violence against gay, lesbian, bisexual and transgender people "is not only acceptable, but humorous." Mr. T distanced himself from these accusations, insisting that he would never lend his name to such beliefs, and that the commercials did not depict them. They are still shown on Australian and UK television. Mr. T did a video campaign for Hitachi's Data Systems that was created and posted on consumer video sites including YouTube and Yahoo! Video. According to Steven Zivanic, senior director and corporate communications of HDS, "this campaign has not only helped the firm in its own area, but it has given the data storage firm a broader audience." In November 2007, Mr. T appeared in a television commercial for the online role playing game World of Warcraft with the phrase "I'm Mr. T and I'm a Night Elf Mohawk". A follow-up to this commercial appeared in November 2009 where he appeared promoting the "mohawk grenade" item, which appears in game and turns other players into Mr. T's likeness. In 2008, Mr. T appeared on the American channel Shopping TV selling his "Mr. T Flavorwave Oven." In 2009, ZootFly announced they had acquired the rights to the Mr. T Graphic Novel and were planning several video games based upon the work. The first (and only) game, "Mr. T: The Videogame", was to have Mr. T battle Nazis in various locations and guest star Wil Wright. It was planned to be available on the Xbox 360, PS3, Wii and PC platforms, however the game was cancelled for undisclosed reasons. Mr. T was offered a cameo appearance in the film adaptation of The A-Team, but decided to turn it down, whereas Dwight Schultz and Dirk Benedict both made cameos in the film. These scenes were shown after the credits, but were reinserted during the film in the Extended Cut. In the 2009 movie Cloudy with a Chance of Meatballs, Mr. T provided the voice for Officer Earl Devereaux, the town's athletic cop who loves his son very much. Starting in 2011, Mr. T presented a clip show on BBC Three named World's Craziest Fools. The show featured stories such as botched bank robberies and inept insurance fraudsters alongside fail videos. In 2015, it was announced that Mr. T would star in a do it yourself home improvement TV show, with interior designer Tiffany Brooks, on the DIY Network. The show, due sometime in 2015, was to be titled, "I Pity the Tool". In 2015, he starred in a series of Fuze Iced Tea advertisements, stating, "The only thing bolder than Fuze Iced Tea is ME!" The brand, owned by Coca-Cola, also briefly centered its social profiles and website around Mr. T.
On March 1, 2017, Mr. T was revealed as one of the contestants who would compete on season 24 of Dancing with the Stars. He was paired with professional dancer Kym Herjavec. On April 10, 2017, Mr. T and Herjavec were the third couple to be eliminated from the competition, finishing in 10th place. Mr. T entered the world of professional wrestling in 1985. He was Hulk Hogan's tag-team partner at the World Wrestling Federation's (WWF) first WrestleMania which he won. Hulk Hogan wrote in his autobiography that Mr. T saved the main event of WrestleMania I between them and "Rowdy" Roddy Piper and "Mr. Wonderful" Paul Orndorff because when he arrived, security would not let his entourage into the building. Mr. T was ready to skip the show until Hogan personally talked him out of leaving. 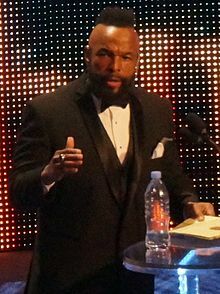 Piper has said that he and other fellow wrestlers disliked Mr. T because he was an actor and had never paid his dues as a professional wrestler. Remaining with the WWF, Mr. T became a special "WWF boxer" in light of his character in Rocky III. He took on "Cowboy" Bob Orton on the edition of March 1, 1986 of Saturday Night's Main Event, on NBC. This boxing stunt culminated in another boxing match against Roddy Piper at WrestleMania 2. As part of the build-up for the match, Piper attacked Mr. T's friend, midget wrestler the Haiti Kid on his Piper's Pit interview slot, shaving his head into a mohican style like that of Mr. T. Mr. T won the boxing match in Round 4 by Disqualification after Piper attacked the referee and bodyslammed Mr. T. He returned to the World Wrestling Federation as a special guest referee in 1987 as well as a special referee enforcer confronting such stars as The Honky Tonk Man. On July 21, 1989, Mr. T. made an appearance in World Class Championship Wrestling (WCCW), seconding Kerry Von Erich. Five years later, Mr. T reappeared in WCW, first appearing in Hulk Hogan's corner for his WCW world title match against Ric Flair at Bash at the Beach 1994. He would next appear as a special referee for the Hogan–Flair rematch in October 1994 at Halloween Havoc, and then went on to wrestle again, defeating Kevin Sullivan at that year's Starrcade. Another seven years later Mr. T appeared in the front row of the November 19, 2001, episode of WWF Raw. On April 5, 2014, at the Smoothie King Center in New Orleans, Mr. T was inducted by Gene Okerlund into the WWE Hall of Fame's celebrity wing. His acceptance speech, largely a tribute to motherhood rather than wrestling, ran long and was eventually interrupted by Kane. In 1984, Mr. T released an album titled Mr. T's Commandments (Columbia/CBS Records), in much the same tone as his 1984 educational video, which instructed children to stay in school and to stay away from drugs. He followed it up the same year with a second album, titled Mr. T's Be Somebody... or Be Somebody's Fool! (MCA Records), featuring music from the eponymous film. In 2002, Mr. T appeared as a bartender in the video for "Pass the Courvoisier, Part II" by Busta Rhymes featuring P. Diddy and Pharrell Williams. Mr. T is a born-again Christian. Mr. T has three children; two daughters, one of whom is a comedian, and a son from his ex-wife. In 1987, he angered the residents of Lake Forest, Illinois by cutting down more than a hundred oak trees on his estate. The national media referred to the incident as "the Lake Forest Chain Saw Massacre". He stopped wearing virtually all his gold, one of his identifying marks, after helping with the cleanup after Hurricane Katrina in 2005. He said, "As a Christian, when I saw other people lose their lives and lose their land and property ... I felt that it would be a sin before God for me to continue wearing my gold. I felt it would be insensitive and disrespectful to the people who lost everything, so I stopped wearing my gold." 1982 Silver Spoons Himself Episode: "Me and Mr. T"
1983 Diff'rent Strokes Himself Episode: "Mr. T and mr. t"
1984 Saturday Night Live Himself/Co-Host Episode: "Mr. T and Hulk Hogan/The Commodores"
1991 Out of This World Himself Episode: "New Kid on the Block"
1994 Blossom Himself Episode: "A Little Help from My Friends"
^ Mr. T 1985, p. 27 — "The name that appeared on my birth certificate was Laurence Tureaud (my father later changed it to Laurence Tero)." ^ "Mr. T". TVGuide.com. Retrieved March 22, 2015. ^ Dunn, Brad (2006). When They Were 22: 100 Famous People at the Turning Point in Their Lives. Andrews McMeel Publishing. p. 150. ISBN 0-7407-5810-1. ^ "Merv Griffin Show 1983". YouTube. Retrieved May 11, 2013. ^ Kleban, Barbara (October 1, 1984). "Mr. T's Sibs Are Teed Off Over Their Bro's New Book". People.com. Retrieved August 16, 2016. ^ "Happy Birthday: Mr. T". Festivalreviews.org. May 21, 2016. Retrieved April 16, 2017. ^ "Dunbar at a glance." Chicago Sun-Times. December 29, 1993. 76. ^ a b "Mr. T Biography". Biography.com. Retrieved August 16, 2016. ^ Mr. T 1985, p. 117. ^ Mr. T 1985, p. 76. ^ Walters, Barbara. 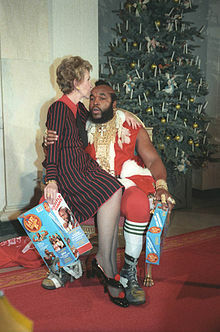 "Mr. T: Tough and Tender in Barbara Walters Interview". Jet. Johnson Publishing Company. 65 (26): 56. ISSN 0021-5996. Mr. T: I changed my name for respect because I watched my father being called "boy"
^ Mr. T 1985, p. 220. ^ Mr. T 1985, p. 218. ^ Mr. T 1985, p. 221. ^ a b Mr. T 1985, p. 136. ^ "Mr. T view the Music Artists Biography Online". Vh1.com. Archived from the original on June 29, 2010. Retrieved August 16, 2016. ^ Mr. T 1985, p. 137. ^ a b Mr. T 1985, p. 139. ^ Mr. T 1985, p. 140. ^ Mr. T 1985, p. 130. ^ Mr. T 1985, p. 131. ^ Mr. T 1985, p. 114. ^ Mr. T 1985, p. 223. ^ Mr. T 1985, p. 224. ^ Mr. T 1985, p. 226. ^ Mr. T 1985, p. 227. ^ Mr. T 1985, p. 234. ^ Cronin, Brian (July 24, 2015). "Did B.A. Baracus Never Actually Say 'I Pity the Fool' on 'The A-Team'?". Huffington Post Entertainment. The Huffington Post. Retrieved August 16, 2016. Before the final match, Mr. T explained to the commentator for the event, Bryant Gumbel, that "I just feel sorry for the guy who I have to box. I just feel real sorry for him." Sylvester Stallone caught this second competition and was intrigued by Mr. T and that line in particular. ^ "Mr. T's Gold Chains". TVacres.com. Archived from the original on May 30, 2012. Retrieved August 16, 2016. ^ "Biography of Mr. T". Starpulse.com. Archived from the original on June 22, 2004. Retrieved August 16, 2016. ^ Canby, Vincent (April 2, 1982). "MOVIES: IN 'PENITENTIARY II,' TOO SWEET GORDON GETS OUT". The New York Times. Retrieved January 10, 2017. ^ Szklarski, Cassandra (March 31, 2009). "Super Dave plans comeback". The Globe and Mail. Retrieved January 10, 2017. ^ "Movie Good: "DC Cab"". May 4, 2011. Retrieved August 16, 2016. ^ "Ice-T IMDb bio". Retrieved August 16, 2016. ^ Keck, William (September 14, 2005). "For Mr. T, gold chains are out, helping is in". USA Today. Retrieved August 16, 2016. ^ "Get some nuts | Snickers". Getsomenuts.tv. January 13, 2010. Retrieved August 16, 2016. ^ "Mr. T attracts viewers, buyers for Hitachi". DMNews. August 8, 2007. Archived from the original on October 21, 2007. Retrieved August 16, 2016. ^ "World of Warcraft Europe - Downloads - Movies - TV Commercials". Wow-europe.com. Archived from the original on June 24, 2010. Retrieved August 16, 2016. ^ "Thane.com". Thane.com. Archived from the original on March 2, 2008. Retrieved August 16, 2016. ^ Clayman, David. "Zootfly Announces Mr. T Games". Xbox360.ign.com. Retrieved April 24, 2010. ^ "News: Exclusive: Sorry Fans, Mr. T Will Not Appear In The A-Team Remake". Latino Review. December 24, 2009. Archived from the original on September 18, 2011. Retrieved August 15, 2013. ^ "Dwight Schultz plays cameo part in new A-team movie". Dwightschultzfansite.nl. Retrieved August 18, 2010. ^ ""Prescription:Murder" and "The A-Team"". Dirk Benedict Central. Retrieved August 18, 2010. ^ "Mr. T To Host 'World's Craziest Fools'". April 1, 2011. Retrieved August 16, 2016. ^ "Mr. T to Star in Feel-Good Home Renovation Series". Popular Mechanics. Retrieved August 1, 2015. ^ "'Dancing With the Stars' 2017: Season 24 celebrity cast and partners revealed on 'GMA'". ABC News. March 1, 2017. Retrieved March 1, 2017. ^ "'Dancing with the Stars' recap: 10s for Rashad Jennings, Mr. T taps out". USA Today. April 10, 2017. Retrieved April 17, 2017. ^ "Kerry Von Erich & Mr. T interview". YouTube. Retrieved March 11, 2012. ^ "WWF RAW". Slashwrestling.com. November 19, 2001. Retrieved August 16, 2016. ^ "Video: Mr. T says the word 'mother' 73 times in WWE Hall of Fame speech". Metro.us. April 9, 2014. ^ "Words of Wisdom from Mr. T". Beliefnet. Retrieved November 22, 2007. ^ Manuel-Logan, Ruth (March 12, 2014). "Mr. T Sued?". NewsOne. Retrieved March 11, 2019. ^ MacEachron, Scout (June 2, 2015). "Mr. T's Daughter Erica Clark Stands Out By Standing Up". NBC. Retrieved March 11, 2019. ^ Johnson, Dirk (May 30, 1987). "Genteel Chicago Suburb Rages Over Mr. T's Tree Massacre". Retrieved April 28, 2012. ^ "Mr. T Chops Away At Lake Forest`s Fiber". Retrieved June 16, 2015. ^ "Mr T Gives Up His Gold For Katrina Victims". February 25, 2009. Archived from the original on February 28, 2009. Retrieved August 16, 2016. Mr. T (1985). Mr. T: The Man with the Gold: An Autobiography (1st ed.). St. Martin's Press. ISBN 9780312550899. Wikimedia Commons has media related to Mr. T.